You are currently browsing the tag archive for the ‘winter camps’ tag. Our thoughts turn to snow today, as snow camp brochures can be seen at libraries and local public schools. One highly recommended annual camp in Japan is called the Snow Camp in Shinshu. Living in Japan, you’d have heard time and again about powder snow…but just in case you don’t, the definition of powder snow is simply “freshly fallen, uncompacted snow.” The density and moisture content of powder snow can vary widely. Snowfall in coastal regions and areas with higher humidity is usually heavier than a similar depth of snowfall in an arid or continental region. Light, dry (of a low moisture content) powder snow of the kind found in Niseko, Hakkoda and many other alpine slopes in Japan is highly prized by skiers and snowboarders. It is often found in the Rocky Mountains of North America as well. 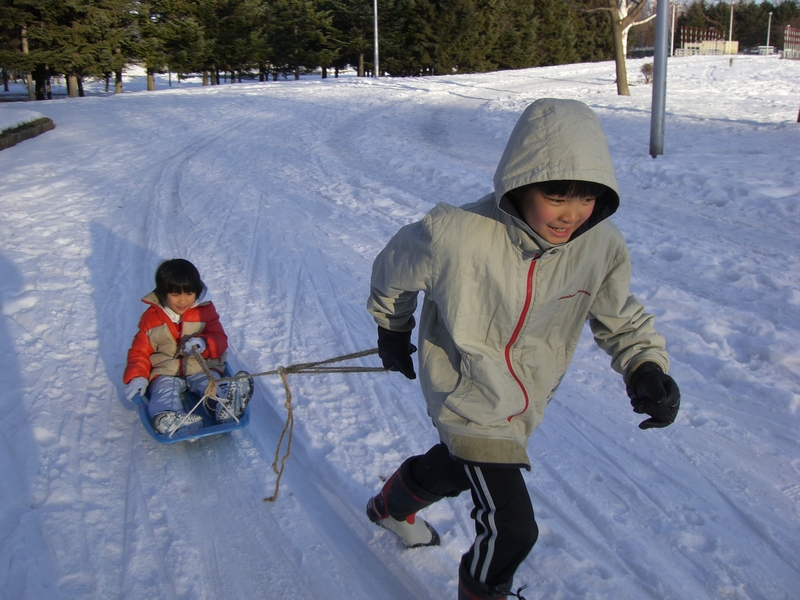 School Centre & Cafe in Hakuba offers many exciting snow programs for kids such as 4-day ski-wees lessons (5-14 yr olds), snow rafting, freestyle ski school program called the Weekend Free Ride Camp, snowshoe trekking, snowmobiling. Younger siblings who don’t or aren’t ready to ski can make use of the nursery or kids room. Parents who can already ski can spend their time cruising or skiing the mountain slopes with a guide. Private lessons go for between 5,000 to 6,000 people depending on the numbers. International atmosphere. Northstar Outdoor Adventures has winter camps that are highly recommended by our members. Winter camps have featured snowboarding at Northstar in Nagano Prefecture in the past. Busing from Tokyo is provided. Says an e-community member: “My daughter has been to the camp several times before (for skiing and snowboarding in the winter, and for hiking in the Alps during the summer), and she has had a great time. She has met other homeschoolers there, as well. The staff includes both Japanese and North American counselors. The cost is 29,800 yen including transportation from Shinjuku; the cost is less for people who get there on their own (about 22,800 yen). Incidentally, at other times Northstar is operated as a lodge. So if the camp doesn’t work out, you could always go as a family, rent a room at the lodge choosing from one of their programs, and go skiing/snowboarding/snowshoeing, etc.” For more details, take a look at the North Star website. English Adventure offers its Annual Winter Ski Camp and ski programs with pro instructors and the English Adventure staff. Learn about nature with a winter walk and nature games. All in English. See here for more details and information about the activities. If camps are not your idea of fun, and you are ready for independent family travel, try the JTNO’s webpage and their Skiing in Japan guide or their skiing in Hokkaido guide for winter ideas. Other great websites for info are Snow Japan, Hakuba47, and Ski Japan. You will also find useful the snow reports at Ski Specialists’ site. You might also like to try booking accommodation at Keep’s Seisen Ryo. KEEP is an unusual Christian and environmental initiative. It operates Seisen Ryo as the centerpiece of KEEP. Opened in 1938 as a lodge and campground for youth empowerment in Kiyosato, Seisen Ryo serves as a conference and retreat center for individuals and groups. Seisen Ryo is centrally located within a short walk of any of the six hiking trails around the area. Just across the road from Seisen Ryo, the Yatsugatake Nature Center offers interactive exhibits about the flora and fauna of the Yatsugatake Highlands, the local culture and history of the Kiyosato area, and information about the hiking trails in the area. Mountains surround the area, with the Yatsugatake Kogen Prefectural Park to the north, Mt. Fuji and the Fuji-Hakone-Izu National Park to the south, the Southern Alps National Park to the west and the Chichibu Tama Kai National Park to the west. Campers and visitors alike can spend time in Seisen Ryo’s coffee shop and restaurant. Seasonal overnight packages are offered with workshop themes such as country furniture building, nature photography, owl watching, or skiing packages with nearby Sun Meadows Ski Resort. Seisen Ryo also hosts public music concerts and other special events throughout the year. See a photo of Keep’s lodgings here. If Hokkaido is known at all overseas, it would be as a popular destination for skiers looking for some of the world’s best powder snow. Beware…you can’ t make good snowmen with powder snow. The microclimate on the island of Hokkaido, which has less rain and heat than the rest of Japan, ensures optimal snow coverage for intense skiing. Try Rusutsu Resort ‘s many snow activities or Kid’s Adventures program or Club Med’s famous focus on kids extends to its action packed ski holidays with comprehensive Kids Clubs for children of all ages. With the Petit Club for ages 2-3 , Mini Club for ages 4 -11 and Junior Club for guests aged 12-17, Club Med Sahoro entertains the whole family and guarantees a great time for kids every day thanks to a variety of fun activities on offer and created especially for them. Club Med package includes superior twin-share accommodation, three meals a day, unlimited wine and soft drinks at lunch and dinner, an all day snacking and bar service, live evening entertainment, a daily ski pass, daily ski school and lessons, kids clubs with ski school. Seven-night all-inclusive packages (per person) start from $1,785 (land only). For further information, please contact Club Med on 1300 855 052, or visit Club Med online. Announcement: One of the most press-touted camps for families seems to be undergoing restructuring: Arai Mountain & Spa Myoko in Niigata that featured a huge range of lodgings from basic cabins to a gorgeous hotel with many kinds of themed activities held on an entire mountain top. For first-timers in Japan, though these aren’t ski activities, you might be interested in the homestay and J-conversation winter programs offered by Geos. If you need tips on planning a snow vacation in Japan, read this article Cyberia: We Ski Web Ski, it’s old but still has good tips.